Bruce Banner is back in The Immortal Hulk #1 and this time his raging alter ego won’t just smash everything in sight, he’ll scare the God dammed bejeezers out of you as well! Following the green goliath’s initial return in Avengers: No Surrender, Marvel’s new horror themed ongoing series The Immortal Hulk from writer Al Ewing and artist Joe Bennett will send Banner’s life spiralling into darkness like never before! With the quote from Carl Gustav Jung ominously setting the tone from the outset, writer Al Ewing immediately sets the scene and premise of the series with a gas station robbery that goes tragically wrong. However, not all the gunman’s victims are as dead as they seem, and once the sun goes down a monstrous retribution soon comes calling! Banner’s return to the Marvel universe – for the most part – was already explained in Avengers: No Surrender, giving Al Ewing unparalleled freedom to hit the ground running with The Immortal Hulk whilst clearly embracing the early issues crafted by Stan Lee, Jack Kirby, and Steve Ditko that made the original six issue of The Incredible Hulk so compelling back in 1962. However, the horror themes in The Immortal Hulk are far darker. It quickly becomes apparent that Banner still can die yet bizarrely when the Hulk rises come sundown its almost as if he has become Banner’s instrument of vengeance. 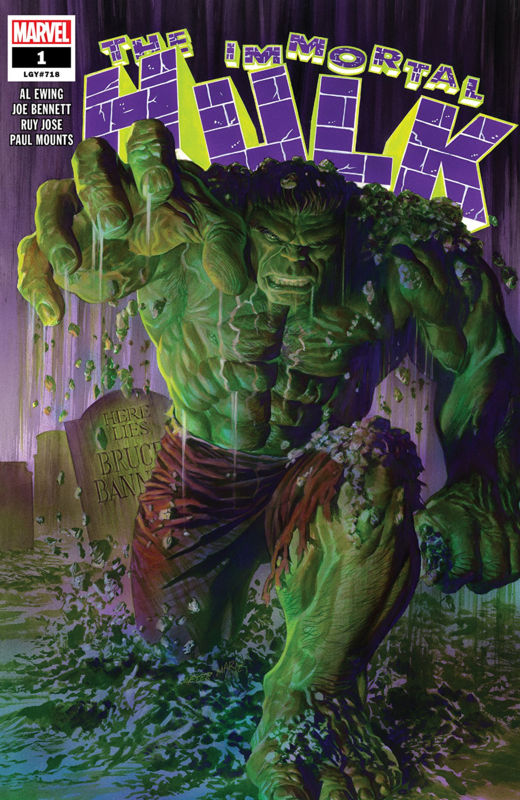 There are some distinct nods to The Incredible Hulk TV series that ran from 1978-1982 as well, especially with one of the new characters names and profession in this issue, and Bruce Banner is very much portrayed by Ewing as a man the world believes to be dead while he desperately struggles to control the raging monster that dwells within him. Simple, uncluttered page layouts deftly convey the powerful beats of Ewing’s script. The art is gloriously rich in detail and atmosphere, with the pencils by Joe Bennett and inks by Ruy Jose complementing each other perfectly. The bright, everyday scenes that kick off the issue almost lull us into a false sense of security, but it’s not long before the Hulk’s wrath is unleashed, and Bennett clearly relishes every moment as the horror tropes build with unnerving intensity with every page. There are big double -spread pages that will make your jaw drop as much as they make your spine tingle. Color artist Paul Mounts also deftly balances vivid and sombre tones to bring a startling clarity to every scene – at times it almost feels like the Hulk is glaring out from the pages right at you! Detective Mayes investigation into the fate of the hapless robber, along with some particular chilling revelations for Banner, all serve to round off this first issue of The Immortal Hulk with a grim blend of mystery and psychological horror. Is he man or monster or… is he both? Yes that wonderfully ambiguous caption from the cover of 1962’s 1st issue of The Incredible Hulk is indeed still very much the underlying question that beats at the heart of this new series. The Immortal Hulk #1 is a comic that presents a dark reflection of itself, Al Ewing and Joe Bennett have done a fantastic job establishing this new series and taking the character of Bruce Banner in an entirely new direction (something that’s clearly evident from its hauntingly impressive cover by Alex Ross alone), and I look forward to seeing how their brilliantly macabre take on the Hulk evolves in the issues to come.